Sometimes people (myself included) forget that there is no air in space… so why is it spaceships always have to be so streamlined and sleek? 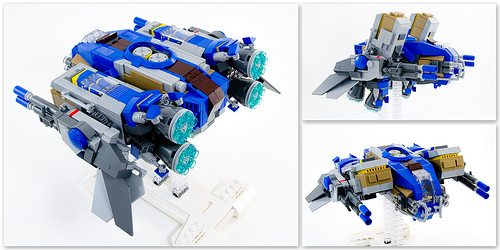 So it’s refreshing to see Nick Trotta’s (tardisblue) latest wonder of a star fighter. It’s big, it’s beefy, and frankly it’s #awesome with a capital #. I just want to swoosh it!